This is a great salsa, and tastes really good on the grilled tempeh. It would probably taste good with many different main meals. Make the marinade by mixing the agave, soy sauce and garlic. Place the marinade in a shallow dish large enough to fit the tempeh slices. Slice the tempeh and allow to sit in the marinade for 1/2 hour to over night. Turning half way so that both sides have soaked. Peel and core the pears and chop in small pieces. In a small bowl, mix the sauce: lemon juice, Thai sweet spice sauce and pinch of salt. Taste and if desired add a bit more hot flavor with Tabasco. Pour the sauce over the fruit, mix well and allow to season. Chop the mint and add to the salsa, mixing well. 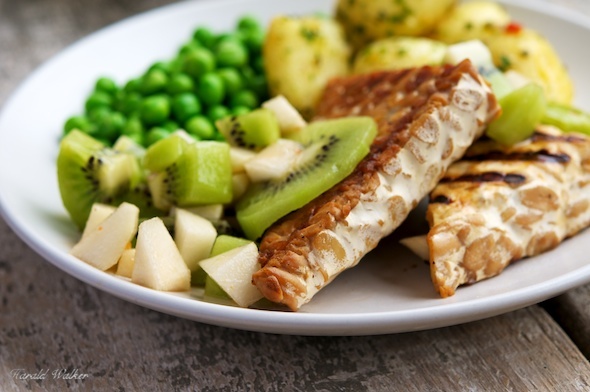 When ready to serve, heat a grill and cook the tempeh chops on the grill until lightly seared. We served this meal with parsley potatoes and fresh peas. It would also be nice with rice ad your choice of vegetable. 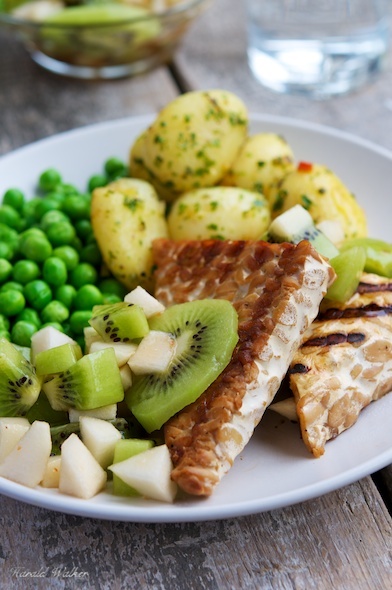 Posted by Chris Walker on February 17, 2012 in Kiwi, Main Dishes, Pear, Tempeh.